One of the great things about travel is that you never know what kind of festival or party you may stumble into. While we were in Vientiane Laos, they were setting up for the SEA Games (Southeast Asia Games). 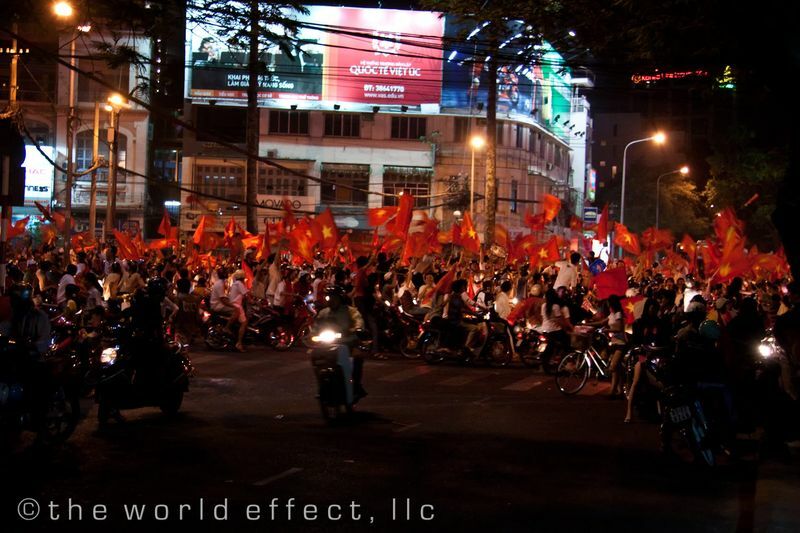 A few weeks later we were in Ho Chi Minh City when Vietnam was playing Singapore in the semi-final game. Singapore has traditionally been a powerhouse football (soccer) team in the SEA Games. 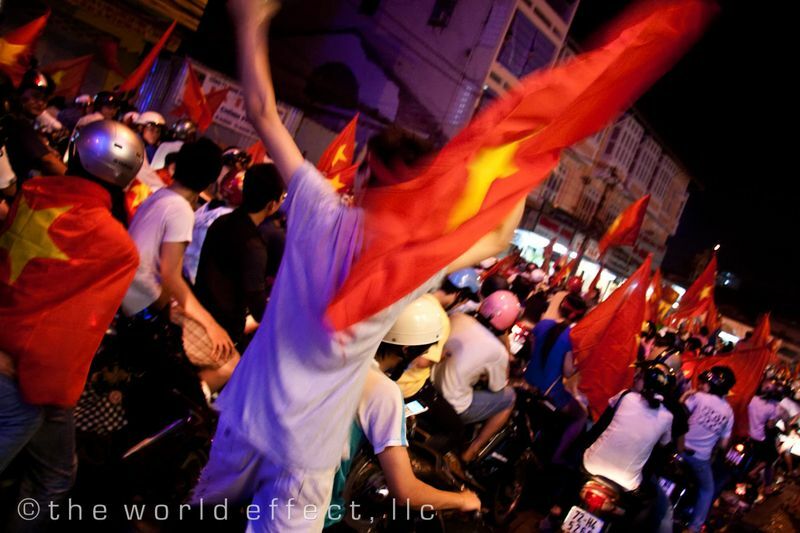 When Vietnam crushed Singapore with a 4 to 1 victory it was a huge upset. 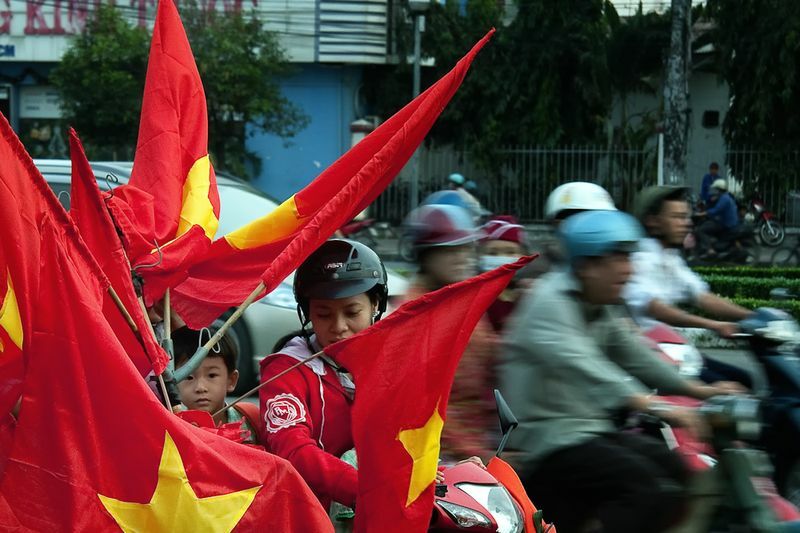 We weren’t sure why all the little street side shops and vendors were selling all the Vietnamese flags in the morning, we thought it was for a national holiday or something. Later we found out about the game and finished our dinner just as the game was ending. 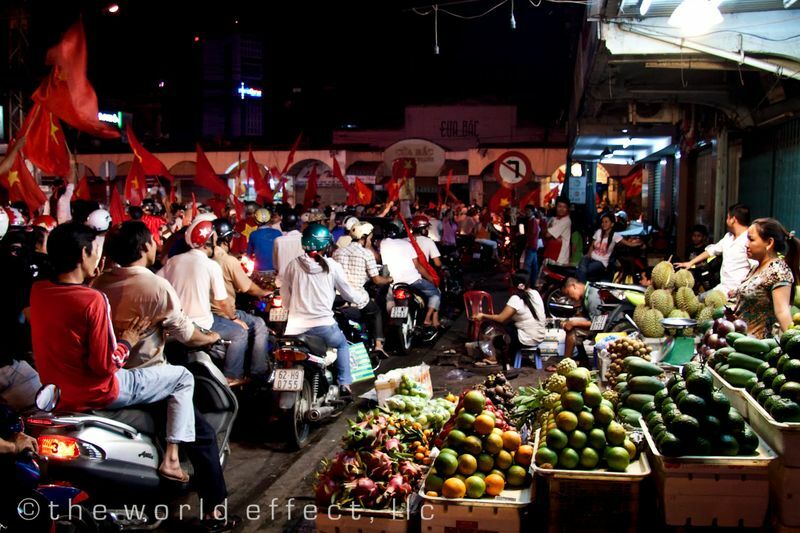 We saw how well the merchants sales skills were, thousands of flags were being waved from the thousands of people riding on thousands scooters. It was an absolute madhouse. 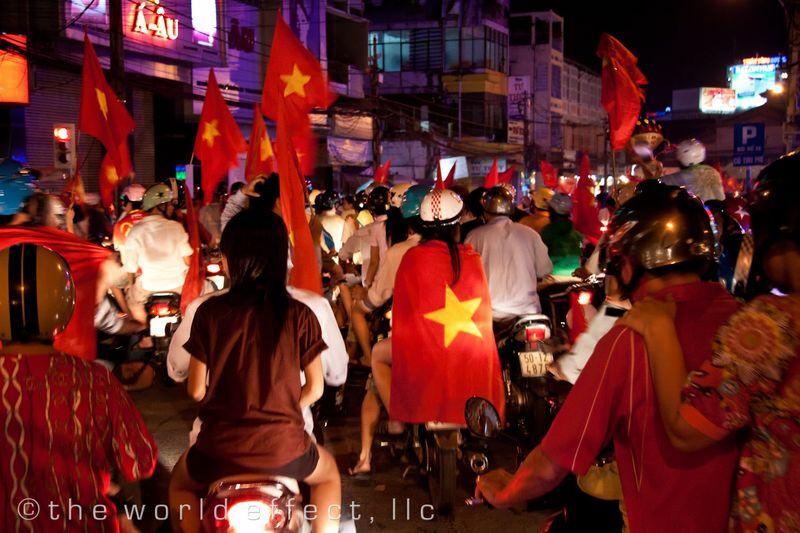 Every street was gridlocked with cheering and chanting Vietnamese football fans. We were in the thick of it with a DSLR and a video camera. We had so much fun celebrating a victory we didn’t even see… the locals didn’t seem to mind, they even gave us flags to wave. I know, we have not had a video forever. I guess you’d call this a mini-video, not quite as produced as our other videos. 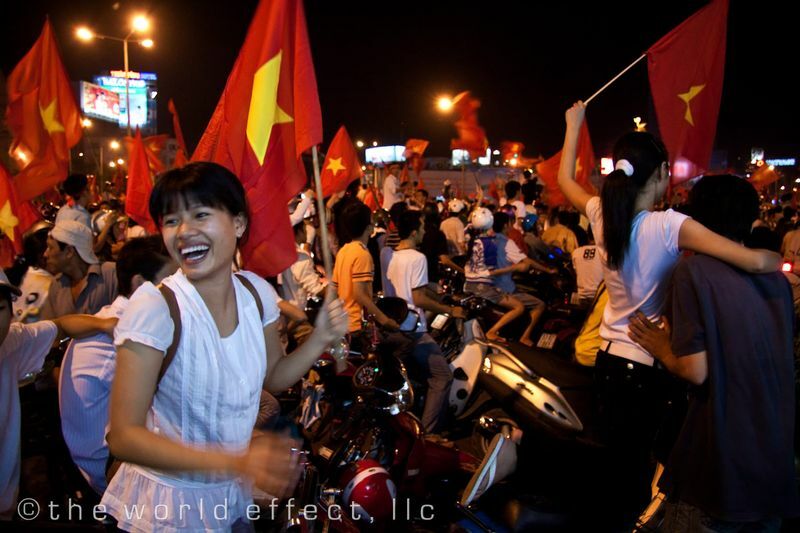 Hopefully this will give you a sense for what celebrating a big game in Ho Chi Minh feels like. We have some other random footage like this from other things, let us know if you’d like to see more. 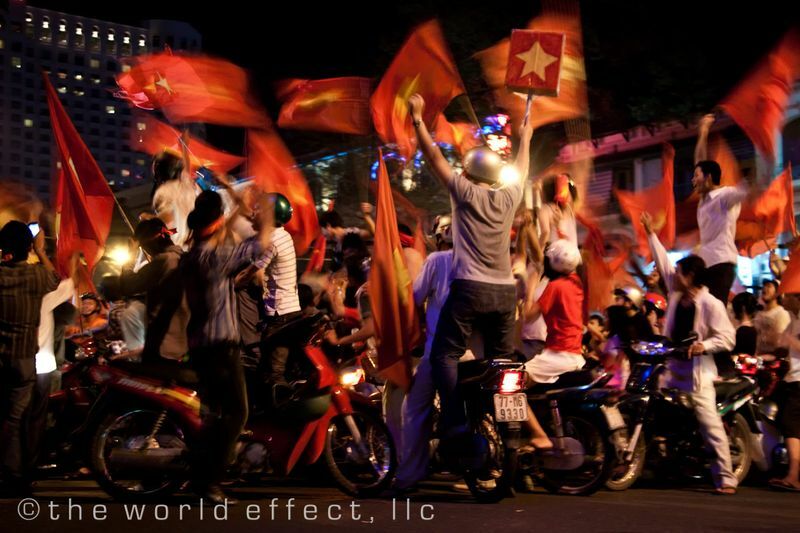 The World Effect Travelogue Video 24: Vietnam from The World Effect on Vimeo. You guys have some awesome photos, but I kind of miss your videos over the past couple of months too! Excellent photographs, unique atmosphere, and i want to go to the festival myself.